CHARLTON ATHLETIC v LIVERPOOL 26/9/53. LEAGUE DIVISION 1. GENERALLY GOOD/VERY GOOD CONDITION. CHARLTON ATHLETIC v DERBY COUNTY 5/5/51. LEAGUE DIVISION 1. GENERALLY GOOD/VERY GOOD CONDITION. 29/8/1921. 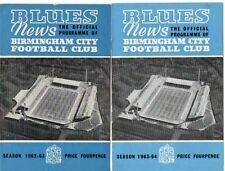 CHELSEA v BIRMINGHAM CITY. OFFICIAL PROGRAMME+TICKET. 1921/22 SEASON. CHELSEA v BIRMINGHAM CITY OFFICIAL PROGRAMME PLUS A 1921/22 MATCH TICKET ALL FROM THE GAME PLAYED ON MONDAY AUGUST 29th 1921..PROGRAMME HAS FOLDS AND CREASES AND IS A LITTLE GRUBBY AS CAN BE SEEN. TICKET IS VERY GOOD..POSTED IN A PROTECTED HARDBACKED ENVELOPE..BUYER TO PAY POSTAGE..
West Ham United 24/8/1963 – score noted and players marked out of 10 – front is a little grubby, and the form on the back page has been filled in. Leicester City 6/4/1964. FIXTURE DATED 21/12/1946. GENERALLY IN VERY GOOD CONDITION. 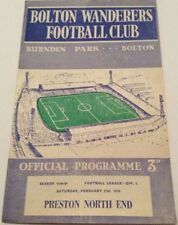 Preston North End 27/4/1963. Bury 12/4/1963 – team changes noted. Portsmouth 21/5/1963 – team changes noted. Grimsby Town 13/4/1963 – light crease down the middle and very slightly grubby. Swansea Town 22/9/1962 – no staples but excellent condition. ALL ORDERS SENT OUT IN HARD BACK ENVELOPES. 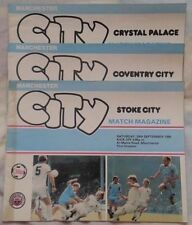 1955/56 Manchester City v Arsenal Football Programme. See pictures - rusted staples and faded front page. No writing. Arsenal v Blackpool Division One 8th Nov 1947. DUNDEE UNITED v. CLYDE FC. Scottish League Division 1 - Season 1965/66. ARSENAL v ASTON VILLA 18/1/47. PLAYED @ ARSENAL STADIUM, HIGHBURY. LEAGUE DIVISION 1. DUNDEE UNITED v. KILMARNOCK. Scottish League Division 1 - Season 1965/66. Liverpool Charlton, (Div 1), 23.3.1951. The programme has a cellotaped edge and the staple is missing. There is also a vertical crease and team changes. (See photos). League Division 1. Result recorded. Manchester United v Everton. Div 1, 16th Dec 1967. League Division 1. No writing. League Division 1. Match details recorded. West Ham United 3/2/1962 – neat team changes made. West Bromwich Albion 25/11/1961. Sheffield United 9/9/1961 – team changes neatly noted. Cardiff City 20/9/1961 – team changes neatly noted and the lightest of creases. DUNDEE UNITED v. AYR UNITED. Scottish League Division 1 - Season 1960/61. Tottenham Hotspur v Sheffield United. Football League Division 1 1966/67 Season. Good Condition. Tottenham Hotspur v Everton. Football League Division 1 1966/67 Season. Good Condition. DUNDEE UNITED v. HEARTS. Scottish League Division 1 - Season 1963/64. Wolverhampton Wanderers v Chelsea - League Division 1 - 28/11/1959 at The Molineux Grounds. Good/Fair more Fair condition, a light fold, date noted on the front cover (see scan) clean, one team change & score noted on the team sheet page. West Ham United 9/4/1966 – light crease down middle. West Bromwich Albion 25/4/1966. Burnley 21/8/1965 – team changes noted. Stoke City 1/9/1965 – team changes noted in pencil – slight creasing to corner of back page. Football League Division 1 1966/67 Season. Fair Condition. Tottenham Hotspur v Liverpool. Division 1 1968/69 Season. Good Condition. This is a reproduction of "The Villa News and Record" for the 1st December 1906 covering the Division One match between Aston Villa and Bristol City. West Ham United 21/9/1968 – team changes and scorers noted. West Bromwich Albion in F A Cup - great team picture in colour in the centre. Preston North End in F A Cup 29/1/1969 – team changes noted. Manchester United 15/3/1969 – great colour picture of Ron Harris in the middle, small mark on the front.